It’s not that people didn’t want to watch The State of the Prostate (Parts 1, 2 & 3) or Clearing up Controversies in Ankle Fracture Management. It’s just that that’s not all they wanted to watch when they tuned in years ago to Channel 27, the University of Washington’s noncommercial, educational TV station. The UW has been broadcasting since 1988, when it launched CableLearn, a station that allowed current and continuing-education students to catch up on missed classes or attend classes from home. It also offered scores of medical videos for laypeople as well as professionals, for those who have a more than a passing interest in root canals, say, or those who like to pass the time watching other people have knee-replacement surgery. This was a fine model at first; a top-tier local university sharing its wealth of knowledge with the community via cable television. But this was before broadband and the Internet blew open the possibility of broadcasting more content to more households in the region. Suddenly, the university had a means of reaching out to the community; to use UWTV to help sing the praises of its faculty and programs to interested viewers not only locally, but all over the world. Now the university could easily blend academic content with an entertaining format in order to share its resources and tell its story. “UWTV was seen as an underutilized asset,” says John Haslam, general manager at the station and a former media consultant and communications executive who worked on developing Comcast’s on-demand service, among other things. He was brought on board in 2009 as a consultant, then hired to help steer UWTV in a new direction. Haslam’s strategy—to help UWTV better connect with community—seems to have worked: Viewership has nearly doubled in the past three years, to 245,000 viewers per week. The station is now available to 1.2 million households in the state, via Comcast, and around the world, via satellite and online. Compare this to other university-run TV stations, which may run as part of student coursework and not necessarily as a professional station. Stations that offer comparable programming, such as those at Brigham Young University (BYU-TV) and the University of California (UCTV) also put up strong audience numbers, but UWTV’s numbers are impressive relative to state population. Haslam credits the jump in viewership to a few simple changes: “We established a more predictable schedule, and we worked hard to make people aware of UWTV.” It putting advertising on bus boards.” It used to be that a viewer tuned in and had to watch whatever medical procedure or collegiate sporting event was showing at the time, but now shows air in predictable slots, and the online archive allows viewers to catch up on missed programs. “The university tried to be more strategic in the type of program it produced,” says Haslam, by learning about viewer preferences and developing programs based on audience data, as mainstream television networks do. One popular show that airs at Sundays at 9 p.m. (and then reruns; find show times and view back episodes of all programs at uwtv.org) is UW 360, a news magazine hosted by Carolyn Douglas, the former KING-TV anchor. This show features people and topics from the UW community—everything from scientists studying how to protect the local oyster industry to a profile of RAVEN, a new surgical robot. UW 360 was picked up in syndication by KOMO-TV and aired for 13 consecutive Saturdays in a prime 4:30 p.m. slot last spring, which Haslam says potentially puts it in front of 10 times more viewers. Also added based on audience data were more live Husky sports events that were not being broadcast on other stations. For example, last year the station a more predictable schedule, and we worked hard to make people aware of used to be that a viewer tuned in and had to watch whatever medical procedure or collegiate sporting event was showing at the time, but now programs air in predictable slots, and the online archive allows viewers to catch up on missed programs. “The university tried to be more strategic in the type of programs it produced,” says Haslam, by developing programs based on audience preferences and data, as mainstream television networks do. 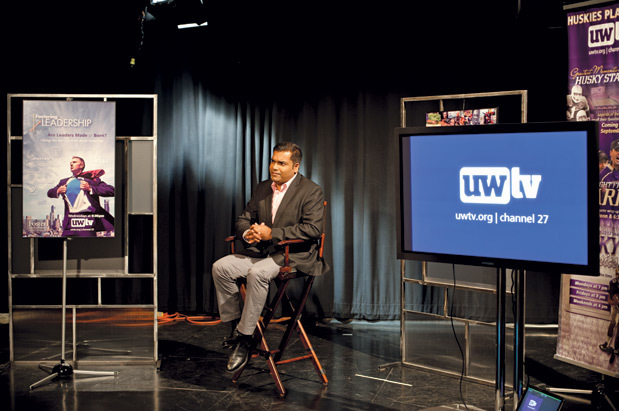 One popular show that airs on Sundays at 9 p.m. is UW 360, a news magazine hosted by Carolyn Douglas, a former KING-TV anchor. This show features people and topics from the UW community—everything from scientists studying how to protect the local oyster industry to a profile of RAVEN, a new surgical robot. UW 360 was picked up in syndication by KOMO-TV and aired for 13 consecutive Saturdays in a prime 4:30 p.m. slot last spring, which Haslam says potentially put it in front of 10 times more viewers. Also added based on audience data were live Husky sports events that were not being broadcast on other stations. The popular “Husky Classics,” an archive of classic games, was created to fulfill the public’s desire for more sports feature programming as a way to draw more viewers. Other new programming based on audience input include Fostering Leadership (Wednesdays at 9:30 p.m.), which presents interviews on business strategy with local business leaders in partnership with the Foster School of Business; and Backstory: The Filmmaker’s Vision, which invites local independent filmmakers to submit films. When films are chosen for broadcast, the filmmakers are interviewed on camera by Andrew Tsao, an associate professor in the School of Drama. Backstory (Saturdays at 9 p.m.) offers the kind of exposure most independent filmmakers can only dream about, and offers viewers the chance to see films that might not be available even at a film festival, such as Ellen Frick’s Another Side of Peace, a documentary about a bereavement group for Israeli and Palestinian families who have lost children in the ongoing conflict; or George’s Bag, a feature comedy written, produced and shot by UW students. Hanson Hosein, director of the UW’s Master of Communication in Digital Media Program, formerly with NBC News and MSNBC.com, began hosting the show in 2010 when it was known as Media Space, with programming specific to media and technology. That show was hugely successful, Hosein says, but the university wanted to widen its scope, to go beyond technology and look at the future of the region. The new Four Peaks format began airing in October 2011, bringing together innovative thinkers to encourage viewers to think more broadly about the region and its impact on the world. It’s like a televised version of the “idea sharing” gatherings popularized in Seattle by groups like Four Peaks, TEDxSeattle (Hosein is a co-organizer) and Ignite. Sometimes recorded in front of a live audience, Four Peaks encourages people to join the discussion via social media and periodic roundtable discussions. Recent topics have included “Hacking Edu,” which explores the relevance of the traditional university model in a time when so many classes are available for free online; and an exploration of the phenomenon of “Seattle nice.” “In the past three years, we have started showing compelling content that you can’t get anywhere else,” says Hosein. Next up for the station is a Native American film series, Voices of the First Peoples, slated to begin this fall (Sundays at 7 p.m.). This will feature contemporary Native American films and interviews with their creators, produced in conjunction with the UW’s Department of American Indian Studies. Also on the horizon—for those who still want to dive deep into academic territory—UWTV will offer a “cabled observatory” from the Ocean Observatories Initiative; footage from an axial seamount that has been installed on the ocean floor on the Juan de Fuca Plate. This will allow viewers access to all the data collected by UW geologists, biologists and environmentalists as they monitor climate change, ocean currents and changes to the sea’s ecosystem.